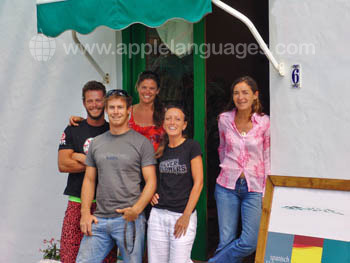 Do you want to learn Spanish in a beautiful island location? Are you interested in surfing, windsurfing, kitesurfing or hiking? 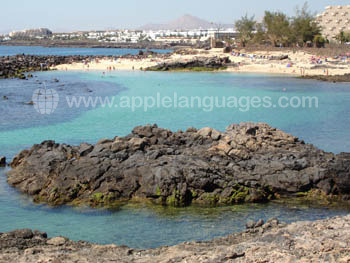 Then take a language course with us in the Canary Islands, and learn Spanish in Lanzarote! Whether you prefer to spend your afternoons relaxing on sandy beaches or practicing adventure sports, this is the ideal destination for you! 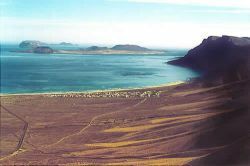 With water temperatures of 20 degrees and above, a wide variety of sheltered lagoons and great reef breaks, surfing in Lanzarote is a popular option amongst our students, and is available for all levels from complete beginners to more experienced surfers. 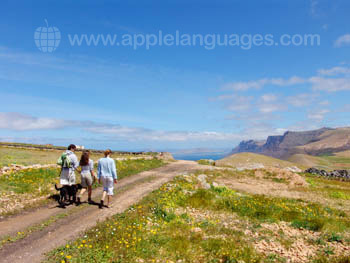 Among the things that our students love the most about Lanzarote are sheer natural beauty and great weather. 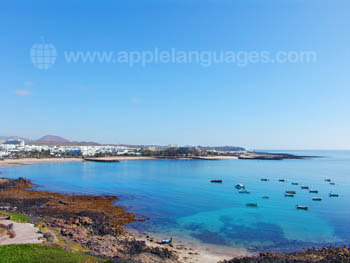 In fact, Lanzarote can be enjoyed no matter what month of the year! From lounging on the beautiful white beaches, to hiking through volcanic landscapes, or even spotting whales, dolphins and turtles, you will find countless things to see and do all year round. 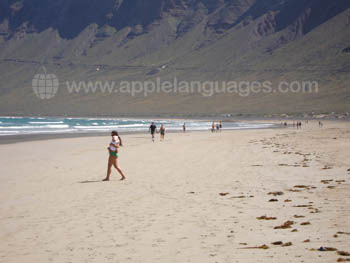 Our school is located in Costa Teguise, a peaceful town known for its gorgeous sandy beaches and horseshoe shaped bay. Popular attractions such as the Cesar Manrique Foundation are just 10 minutes away. Our school is centrally located, with everything you need close by – from shops and bike hire, to traditional tapas bars. What’s more, the beach is just a few metres away! Our school has Internet access and comfortable classrooms with natural lighting. 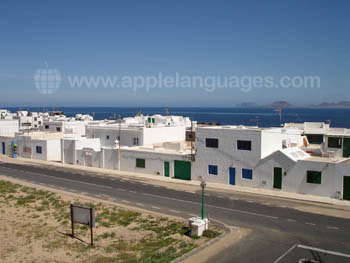 We offer a wide range of Spanish courses in Lanzarote, so you will certainly find something to suit your individual needs! For a less Intensive learning experience, opt for our Semi-Intensive Spanish course of 10 lessons each week. You will have 2 group lessons per day, taking place in the morning, allowing for plenty of time to explore the island and its many attractions. Alternatively, you can choose the Intensive course, consisting of 20 lessons. This course aims to raise your general level of Spanish, and build on key language skills to facilitate communication and improve confidence! For more flexibility and personal attention, choose a course of Private Lessons only, which will allow you to tailor your learning to suit your individual needs. Or, for adventure-seekers of those wishing to learn a new skill, why not take a more specialised course, such as Spanish combined with Surfing, Windsurfing or Hiking? 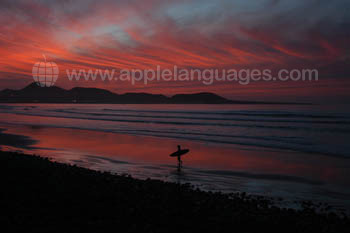 Our Spanish and Surfing course consists of 10 Spanish lessons plus 2 surf trips each week. Surf lessons take place at Famara Beach, which is well-known its Hawaiian-style waves, and full-instruction is given by qualified and experienced surf instructors. Suitable for surfers of all levels, these lessons include technical briefing and exercises followed by a session under close supervision. All equipment is provided. On our Spanish and Windsurfing Course, you’ll enjoy 10 Spanish lessons, plus a 6-hour windsurfing course taking place over 4 days, and 3 or 6 hours windsurfing practice (depending upon your level). What’s more, we include all equipment, including wetsuit and water shoes! 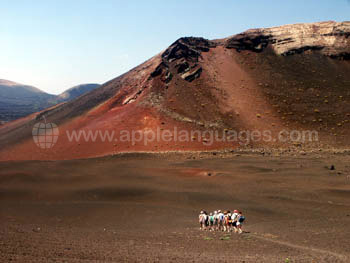 Our Spanish and Hiking Course consists of 10 Spanish lessons and 2 treks, including a coast-to-coast trek and a trek through Lanzarote’s vineyards! You’ll trek in the mornings, and learn Spanish in the afternoons! Don’t forget to bring good walking boots and a camera with you! 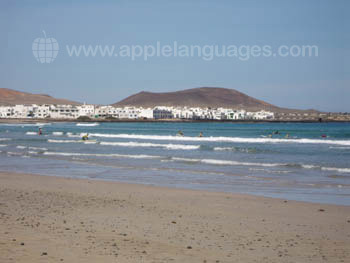 In Lanzarote, you can choose to stay in one of the school’s studio apartments, located in Costa Teguise, just 100m from the school and close to the surfing, windsurfing and hiking centres. All studio apartments are fully-equipped and within walking distance to many bars, restaurants and cafes. 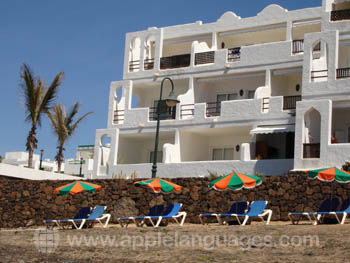 Alternatively, why not stay in a private apartment in Lanzarote? These beautiful apartments are situated right on the beach-front, with beautiful views of the ocean. Each apartment is fully equipped, with access to a swimming pool. 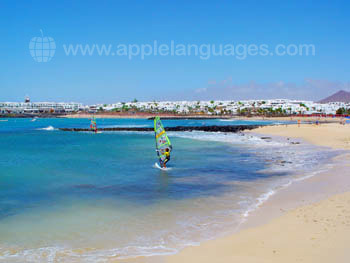 To help you get the most from your Spanish course in Lanzarote, our school will be pleased to help arrange activities such as snorkelling, scuba diving, surfing, trekking and mountain biking! If you’re interested in taking part in a language exchange during your Spanish course, ask about the language exchange program at our school. Most of our students fly into Arrecife Airport, which is just 20 minutes away. 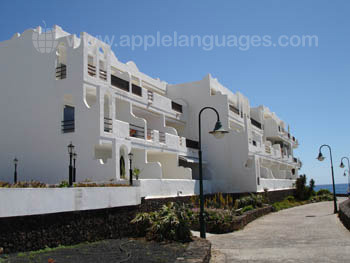 We can arrange airport transfers to Costa Teguise if required, at an additional cost. Average score for our school in Lanzarote based on 25 previous client reviews. Studying in a very friendly atmosphere with perfect didactic preparation and individual support throughout. The study rooms are very comfortable and the teachers are very nice and competent. I had at 5 days private lessons and was taught all the tools. The registration procedure was very easy and the advance information are very good. Information about further proceedings were made very quick. Very recommendable! Very good teacher who balanced the level of the class well for students of mixed ability. She made the lessons fun which helped everyone to learn and remember. Thanks Marcela! Nice apartment which was much better equipped than average with coffee machine, washing machine, stereo and plenty of fresh towels. I enjoyed the course very much- excellent teachers; only slight criticism would be that the course materials (photocopies etc) were sometimes not available at the start of the session. I didn't book the accommodation offered, but wish I had! It looked very attactive and comfortable. The course was excellent and the teachers nice. I learned a lot during my stay. Everybody was very friendly and helpful and the lessons were of high quality. The staff here were excellent in that they actually spoke excellent english which meant that the little impossible things that could be lost in translation were not. 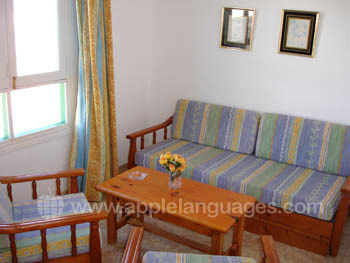 The accommodation was only a step away from the school which was great and it was private and very clean and well kept. Wonderful course, as I was in between levels and this course was tailored to my needs exactly. Please may i commend my teacher Pilar, she is an excellent teacher,. Excellent course. Laura, Marcella and Soraya provided an interesting, challenging and enjoyable introduction to Spanish for me and my wife. They were keen to help us learn, were flexible in their approach and created a very positive environment in which we felt we made more progress than we could possibly have expected. The staff here were excellent in that they actually spoke excellent English which meant that the little impossible things that could be lost in translation were not. 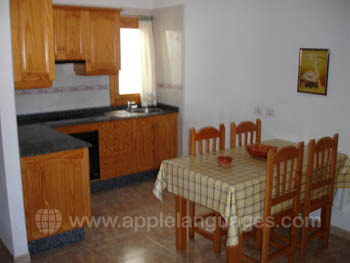 The accommodation was one step away from the school which was great and it was private and very clean and well kept. I enjoyed the course very much and the teachers were excellent, I would definitely attend the course again. The teachers were very good and I think I've learned a lot in those 7 weeks! I just had a great time! My accommodation was great too and I made a lot of friends. The teacher was great and taught me a lot. The course was perfect and I would love to do one again soon! I started my course with no previous knowledge of Spanish, after a week I could speak Spanish, remarkable! I it owe all to my excellent teacher. 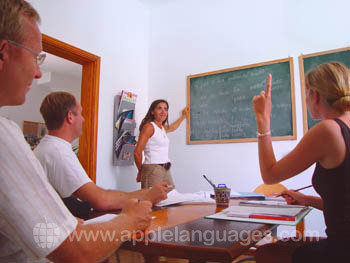 My Spanish course was very good, as were all the staff. A special word of thanks goes to my excellent teacher! The course was relaxed and enjoyable. The accommodation was well kept and reception staff very helpful. The course was excellent and really helped me make very good progress on my spanish, this was down to one key factor, the excellence of the teacher! I really felt that she tailored her entire approach to meet my current capability but to help me to do better and go further with the langauge. She was able to do this in a way that made the time fly by. My teacher was fantastic when I found the first class too difficult for 'beginner' level - she made a real effort to sort out other classes and some one to one sessions. My host was very friendly and welcoming and the accommodation was fantastic. I did some intensive salsa classes which were excellent - and all in spanish! Surfing in Hawaii? No! Go to Lanzarote! !